The Medics Suite for Internal Medicine represents a uniﬁed approach to virtually any Internal Medicine EMR / EHR requirement needed, along with integrated practice management functionality. What is the Medics Suite for Internal Medicine? A clean and highly visual system taking IM encounters to new levels of eﬃciency with data entered via quick clicks on an iPad™, and with transparent functionality using iPhone™, Android™, or essentially any other internet enabled handheld device. The Medics Suite for IM can also be accessed using a desktop, laptop or tablet PC. A 2015 Certified EHR that’s highly comprehensive, yet is also light and clear with a rapid reaction time. 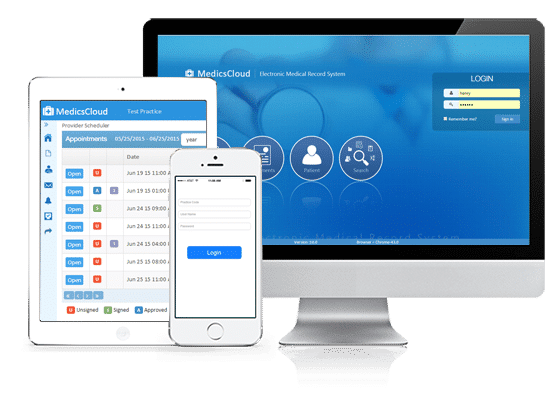 It’s a true cloud-based solution that will make your Internal Medicine EMR / EHR experience one that’s easily unencumbered. A system where instantaneous and accurate ICD-10 coding is enabled during the encounter using the digitized Medics Suite for IM superbill, or through a Google™-like search ability using code-related keywords; either method can be used as preferred by the provider for accurate billing. Integrated Internal Medicine practice management software for a variety of capabilities including patient demographics, scheduling and more. A system that supports the secure MedicsPortal making your practice bi-directionally accessible to patients 24 x 7 x 365, helping to keep them engaged and connected on multiple levels while creating amazing eﬃciencies in terms of requesting appointments, completing “paperwork” online, and more. A system that operates under WindowOne™ architecture which displays required information essentially on every window view, eliminating the tons of “hunt and peck” keystrokes typically needed to ﬁnd that information. Revolutionize your transcription eﬀort with the Medics Suite for IM and its built-in Medics FlowText! Working with Dragon Medical™, Medics FlowText intelligently data-populates the correct ﬁelds in the patient’s record as the report is being transcribed. This voice-to-text-to-data-entry capability allows the transcriber to complete the report - and have the data entered - in one pass! At the same time, Medics FlowText enables the Electronic Health Records for Internal Medicine to be highly voice-command navigable, greatly reducing -- if not completely eliminating -- the user’s need to touch a keypad or mouse. The Medics Suite for IM will automatically alert the physician during the encounter if the patient is a candidate for a clinical trial based on parameters such as diagnoses, procedures, age, gender, location, etc. The trial is explained and consent can be obtained right there, or the patient can advise the practice later. Use the Medics Suite for IM to proactively data mine your entire patient population in order to ID candidates for a particular trial(s) giving you the ability to advise those patients that a trial exists. The Medics Suite for IM will then manage and report on your clinical trials as required by the sponsoring (pharmaceutical) companies and / or any clinical research organizations (CRO). The potential improvements in patient health that can result through newly developed therapies is gratifying. The additional income typically derived by the practice from the sponsoring companies can be quite extraordinary. In addition to these capabilities, all of the features you’d expect of an Internal Medicine EHR today are handled by the Medics Suite for IM, such as e-Rx for controlled and non-controlled substances, lab orders and results, mechanisms for continuity of care, embedding and access to images and documents, and so much more. On the practice management side, the Medics Suite for IM opens into patient demographics, scheduling, and a variety of other capabilities, with wide ranging EDI through the Medics PM. MedicsRCM is available for IM groups or practices that prefer comprehensive, outsourced revenue cycle management.